On my third day in the hospital, a porter whisked me away in a wheelchair for numerous tests. How I longed to take the still-hidden Squiffles with me! But the picture of a mature aged lady sitting in a wheelchair with a stuffed lion was too much to visualize. The inevitable happened. While I was away, the nurses made my bed. When I returned, I found Squiffles out of hiding, lying on my pillow and watching the two opposite sides of the door for my return. Swallowing my embarrassment, I climbed cautiously into bed and slipped him under the covers. My secret was out, however. Each time a staff member came to my bedside, they asked after my lion. Soon everyone knew his name. My ward family would ask, “How’s Squiffles this morning?” sometimes before asking after me. He became a little mascot of hope in that ward. Brenda, who lay in the bed next to me and was recovering from major back surgery, got her husband to bring her teddy bear to the hospital. The multitude of tests gave me an insight into the future. These were not routine tests. ‘They’ were looking for more cancer. The chest X-ray proved negative, as did the liver and abdominal sonar. I hated the way they told me the good news. They seemed disappointed. It was as if they were saying, “But one day we will find it . . . . The entire body bone scan was scary. Out of the corner of my eye, I could see the man at his computer studying the images. Images of my body. What could he see? When the man gave me the envelope to take back to the ward he smiled reassuringly. Trying to co-operate with the various technicians was made awkward by the ever-present sling, yet they were all so kind and understanding, so patient with me; so . . . sorry for me? Tests in the past had never bothered me. They were “just routine”and wouldn’t show up anything. Shirleys don’t get cancer. Now it all seemed different. I received so many flowers it became embarrassing. Both cardiac tables were by now full. Flowers lined up along the wall under the window. A difficult decision had to be made. Each visiting time, Rob and the boys would leave carrying beautiful arrangements of flowers. We tried to choose those from people who wouldn’t be able to visit me, then at least we didn’t have to admit to sending their flowers home. Yet they all lasted so well I didn’t need to worry. Back home my “indoor garden” awaited me. I wish I could list all the Scriptures I received at this time. I wish I could share all the wonderful things the Lord said to me. If He said anything specific, I have forgotten it. However throughout that week I was constantly aware of His presence and His guiding hand. Little things, like Beulah, the Jewess, spoke to me of His amazing love. I tried to read my Bible often but usually gave up in frustration. The drugs plus the clumsiness of being one-armed, made reading my big Bible difficult. I contented myself with reading the small booklets and cards I received from many. I prayed, but only a loving Father would have understood. My words were often jumbled and incoherent from the drugs. Somehow, I just didn’t know how to pray. I found that the one thing I could still do was praise. And so I praised. I praised Him for my life and for my family. Then I praised Him for the removal of the monster, which I now thought of as Goliath, naming it after the story of David and Goliath. I tried to think of it as a giant, a monster, that had been destroyed by the surgery. All day long I found more reasons to praise Him. The more I praised Him, the closer I drew to Him. I asked myself, for the first of many times, How do people cope with cancer without the Lord? 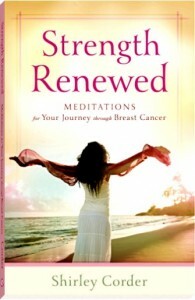 Somehow it never occurred to me to say, “Why me, Lord?” If anyone had to have Breast Cancer, why not me? Throughout this period I learned to appreciate the small things. I learned how much I was loved. People really cared. The visits, the cards, the flowers—they all meant so much. The cards I received were wonderful. As a keen stamper I had made thousands of cards over the past few years and taught many people how to stamp. It thrilled me to receive hand-stamped cards. I knew how much time had gone into making them. Some were elaborate and beautiful. They took hours of love to create. Others were simple but made especially for me. People had given up their time to make something – just because they cared for me. Even the simple words, “Wishing you a speedy recovery,” encouraged me, probably more than the sender anticipated. In a time of negative vibes from all the tests, that message brought me hope. The sender expected me to recover. Read on: Next Chapter: Welcome Home! These events occurred between the years 1997-2000. I have tried to recreate events and locations as accurately as possible, but in order to maintain their anonymity, in some instances I have changed the names and identifying characteristics of individuals and places.